It seems the prayers of Games Workshop's fans may have finally been answered. The much criticised writer of Codex: Grey Knights, Codex: Blood Angels and the Fantasy Daemons armybook updated his LinkedIn page to say that no longer working for Games Workshop. According to this he departed back in May of this year after over a decade of working for the company. While there has been no official announcement from Games Workshop itself relating to his departure, this page does appear to belong to him rather than being a faux account. Many of his skills are endorsed by current and former members of the company, and the image used is not one which can easily be found via a quick Google search. This is something many people have been hoping to happen for many years, ever since the writer was given the reigns during Warhammer 40,000's Fifth Edition. Deeming "they can never be Ultramarines" to be a detrimental failure of many chapters, and lacking any apparent respect for his fellow co-writers or the lore the setting was based upon, his works were lambasted by both critics and the community alike. This is to say nothing of the rules of his armies. Rather than encouraging tactical awareness or skill for their use, many were built to win through sheer raw power, with the aforementioned Daemons armybook infamously triggering the early release of an entirely new edition thanks to it breaking the game. However, on a personal note I do wish to point out to the community that, even if this proves to be completely true, it will not be the answer to all our problems. While Ward was responsible for a severe drop in the quality of Games Workshop's main franchises, he is not solely responsible for this. Phil Kelly and other writers have produced similarly negative works despite being better regarded among fans. The likes of Warzone: Damnos in particular veered into the same invincible Ultramarine trends Ward was infamous for, and other codices have displayed severe problems. Furthermore, while many of Ward's books were those which most frequently featured them, it was the design team rather than he which produced the likes of the Centurion, Dreadknight and Stormraven. While this means that we will hopefully see no further Bloodtide incidents or something so terrible as Codex: Iyanden, it's hardly going to improve the company overnight. Finally, this may not even be the sign of Games Workshop finally getting its act together. As mentioned last week, others responsible for Games Workshop's financial slump and enmity with its own fans are now abandoning their positions. For all we know, this could be him taking the same action before the company folds rather than, as many fans would wish, being sacked for gross incompetence. I can personally only hope that this is a sign of Games Workshop attempting to push for better quality as things become progressively worse rather than signs of it finally dying out. I still think all Matt Ward really needed was an editor to keep him on track as opposed to being sacked entirely, even so I'm not going to miss him. Now all we need is Phil Kelly gone too (or also given an editor). I also don't think Matt Ward is an idiot (as far as real life goes), if he's actually leaving I'm treating it as another employee jumping off a sinking ship. A lot of people do argue that but, looking back through his work, i'm honestly not sure that's the case. If you look at his lore and rules, he seemed to be actively becoming worse over time with Codex: Space Marines being comparatively tame in comparison to Codex: Grey Knights. There's the famous joke that he took criticisms for his last book as suggestions for the next one, but looking back through them I honestly think that might have actually been the case. Even were it not for that however, I don't think an editor would help cure his sheer lack of respect for the works of other writers and established canon. There's only so much an editor can fix after all, and it certainly would not have fixed Codex: Clan Raukaan or Codex: Sentinels of Terra. This is not to mention the fact those books featured the mysterious retconning of certain novels into oblivion, only for their plot elements to show up being used in his stories. It's not as if he was lacking feedback to his problems. True, a lot of it would consist of him sifting through hatred, but he brought that upon himself, and there have been better writers who have improved their work by doing just this. His response though, that seemed to be a sheer lack of caring. When someone approached him and spoke about the broken state of the Fantasy Daemons rulebook, the man infamously responded with "It would be a shame if they weren't." Kelly i'll agree with you upon entirely, as he does desperately need a good editor but has been shown to produce genuinely good work in the past. The same goes for Cruddance and a few other writers. Ward though? I honestly don't think there was any redemption for Ward, not after six years without ever having learned a thing. The content might have been worse, but he knows how to use structure and descriptions well, he knows how to build up as well as fitting a lot of information on small pages, and he also knows how to step back and leave what can happen to the imagination of the reader, so he can be a good writer since he knows how to write, the problem is what he puts into his books. I can agree with Clan Raukaan, and Sentinels of Terra, but at least a good editor would have stopped them from coming out. What's weird too is after doing a terrible job with Daemons, he then did a pretty good job with the most recent High Elves army book in Warhammer Fantasy (which I think was the last book with his name on it), I originally had some grievances with it but after playing several games the rules themselves are fine, he stuck true to their lore, and previous books (not just rulebooks either, it's like he actually read some of the novels), he reintroduced old characters without radically changing their lore, I have no idea why High Elves was able to escape him changing so much, who knows, maybe he was working in the wrong area this whole time. Actually I want to bring up his terrible job with Daemons in Fantasy one more time, the reason people remember it as terrible (and it is) is because the whole army is completely broken (everything being priced way too low is the main force behind that), but all the lore in the book is rock solid. He knows how to write Daemons losing in a fight to regular humans (but they were Khorne's demons, so he's happy anyway), he knows how to do characterisation of the different Daemons pretty well, he knows how to inject humour into the book and make it feel natural, the entire time in the lore he stays close to the source material, I know some people who started playing Daemons at the time not because they thought the army would be good, but because they liked the book so much they wanted it to be the army they played regardless of how great the army actually was. What helped the most with this is unlike 40K, the Realm of Chaos in Warhammer Fantasy actually IS a place you can flat out walk to and walk around in, as well as leave thinking the whole thing was mildly unpleasant and upset you now know things you rather wouldn't want to know, these aren't things that would completely destroy you like they would in the Cthulu Mythos, these are just things that would make you upset for a while before you come to terms with them. It's a shame the realm of chaos all spilled over to 40K and the warp became almost exactly like it, but maybe that explains most things behind Codex: Grey Knights and Kaldor Draigo, thinking that the Warp is like the Realm of Chaos, and that the Daemons from the Warp were like the Daemons from the Realm of Chaos (who are a LOT weaker), not that this excuses any of that of course (as he really should have read up on how things were different), but at least it's an explanation. Okay, just to confirm I am going to reply to this once I get the chance but I need to check a few details in prior codices first. While i'm going to disagree with you on a few points, there's a lot of sense you're making here. What's more is that I think you might have highlighted a big point i've been missing behind Ward's work in 40K. One which might actually explain a lot if i'm remembering certain details correctly right. I think I can help you with your search here, Warhammer and 40K were interconnected until roughly 5th edition Fantasy, and 3rd edition 40K, 4th Fantasy was still slightly connected to 2nd edition 40K in the Realm of Chaos book (4th edition) where they started to separate, and in 3rd edition Fantasy the two realms were the same thing, when 5th and 3rd happened they split their timelines aside from a few references (mostly the lizardmen in fantasy). The best books to look at for seeing what the warp is supposed to be about and what the Realm of Chaos is about is both the 3rd edition Chaos Space Marine book for 40K (which used to include all of the daemons and it loosely defines what the inside of the warp is), the 4th edition Chaos Daemons book for 40K (very clearly outlines everything about the warp and keeps it in line with the 3rd edition Chaos Space Marine book), and the 5th edition Hordes of Chaos army book for Fantasy (which gives a lot of information on the Realm of Chaos). I'm curious, what's your opinion on the new Grey Knight book getting no new kits? Mixed personally. On the one hand i'm glad they're not trying to push anything else shiny or special on the chapter after last time, but on the other the Dreadknight and a few other units could have seriously used some redesigns. 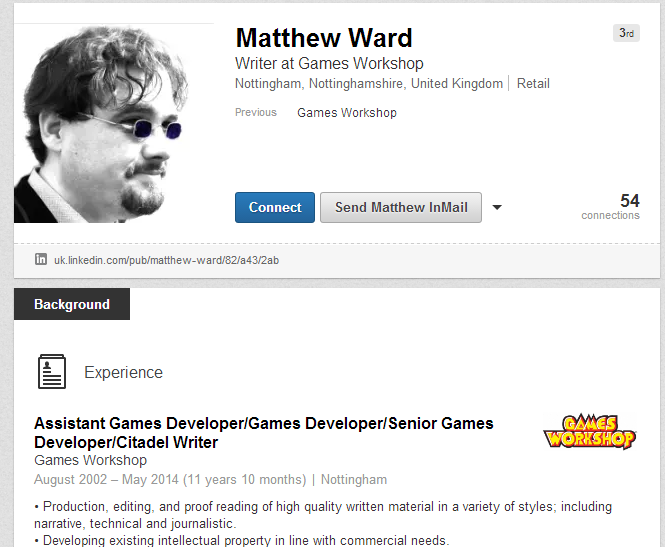 The Unrealised Failing of Matthew Ward?